Asbestos is a set of six naturally occurring silicate minerals and are commonly known by their colours as "blue asbestos", "brown asbestos" and "white asbestos". They are divided into two fibre type groups, Serpentine and Amphibole. Asbestos mining began thousands of years ago, however it's widespread usage began in the late 19th century and continued to be used throughout most of the 20th century. The widespread usage of asbestos was driven by its desirable physical properties, being highly resistant to heat, electrical and chemical damage, having a high tensile strength and sound absorption abilities. Asbestos was a commonly used material in both commercial and domestic properties up until 1999! 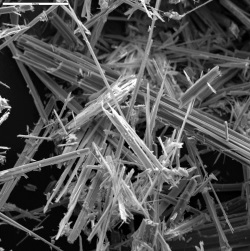 Inhalation of asbestos fibers can cause serious and fatal illness including malignant lung cancer, mesothelioma and asbestosis. Asbestos exposure is responsible for the death of more than 1800 people each year in the UK. This figure is set to rise to more than 2000 per year when its peak, estimated to be between 2015 - 2020 is reached. Receive a 15% discount on your asbestos survey by completeing our online quotation enquiry.